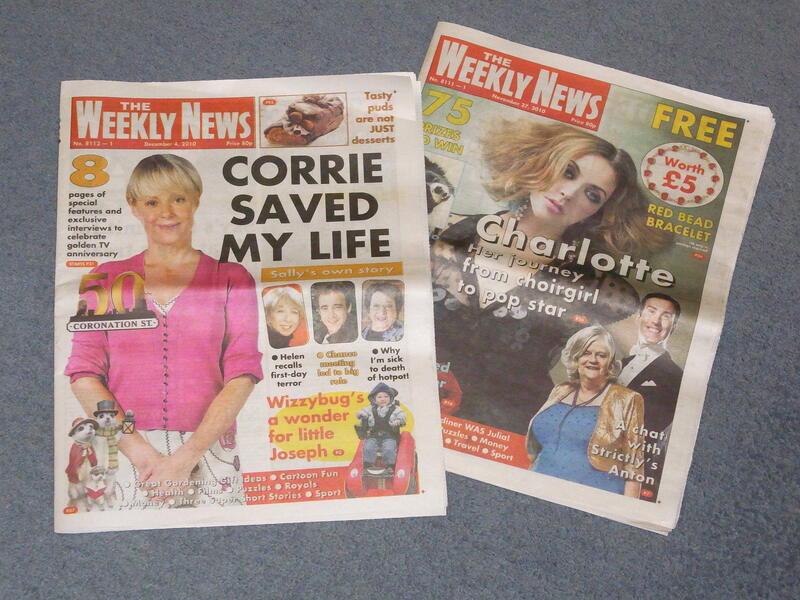 The Weekly News prints three short stories a week. However, it is a market that is sometimes overlooked by writers targeting women’s magazines because it is published in newspaper format and can be difficult to find in the newsagent. I buy my copies in WHSmith or Tescos. Jill is also a fan of twist in the tale endings and topical stories. Stories range in length from around 800 to 2000 words. They are generally written in the third person and often from a male point of view. A disgruntled train commuter on her last journey to work before she switched jobs – to Customer Services Manager for the train company. A lady joins the gym to get fit for her 50th birthday party but hates it. However she does find a keep fit routine that suits her and is able to make a grand entrance to the party – as a belly dancer. A lady in bed and unable to sleep yet again because of the noise from the party next door. She finally cracks, gets up and goes to the shed to get something before joining the party – with two bottles of wine. Some of the plots above may have lost something in my re-telling (apologies to the authors) but you get the idea of the type of thing that Jill Finlay chooses for The Weekly News fiction pages. Submission is by email only to jfinlay@dcthomson.co.uk. Further detailed guidelines can be found on Womagwriter’s Blog. And if you’re visiting my blog for the first time, click here for details of my free prize draw. This entry was posted on January 21, 2011, 12:11 pm and is filed under Markets. You can follow any responses to this entry through RSS 2.0. You can leave a response, or trackback from your own site. Helen, I know that Jill had a lot of problems with her broadband before Christmas and many of the emails that she thought had been sent were still sitting in her Draft folder. She is now working her way through re-sending them all. I’ve had two ‘belated’ emails from her in this way – one acceptance and one rejection. Hi Kath – I’ve got a story outstanding with The Weekly News since last November. It is difficult to know what to do without making a nuisance of oneself. Hi Jenny, Thanks for dropping by. The last time I had a story in The Weekly News I think I got around £80. If you enjoy writing short stories, it’s a market worth targetting. Thanks for this analysis of The Weekly News, Sally. I was about to sub a story to them but now I’m going to beef up the twist. Wish me luck. Best of luck, Charlie – and be prepared for a long wait before Jill Finlay, the editor, gets back to you. Well done on your success, Alice. Thinking up a good twist can be hard but when they pop into your head it’s wonderful!